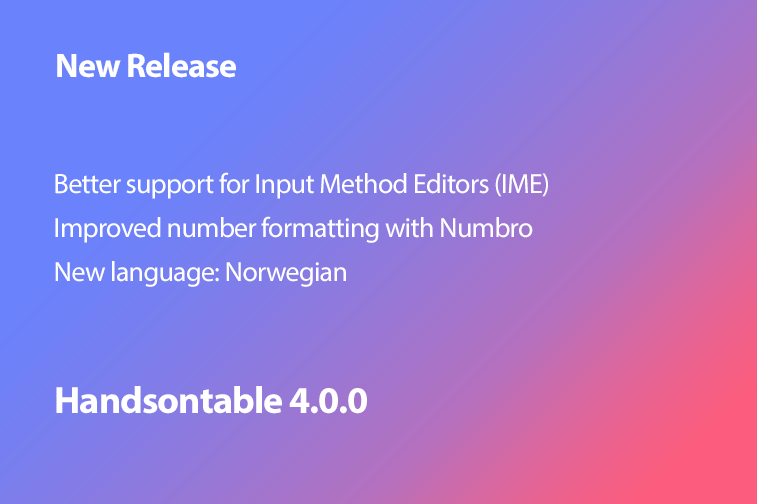 We are introducing a new version of Handsontable (CE/Pro) 4.0.0. This time we have focused almost solely on enhancing the support for Input Method Editors (IME) that are very popular in East Asia. It turned out to be much bigger task than we initially anticipated, mainly due to the large number of tests we had to conduct across various browsers and operating systems. Other tasks addressed in this version are connected with filtering, sorting and formatting numbers. The latter required us to update Numbro, which we use to handle the formatting and manipulating numbers. There is also one new language, Norwegian, suggested, examined and accepted by our community. Thanks guys! In order to keep your implementation working correctly, you need to update the Numbro 2.x-compatible language files. For more information on those, take a look at the Numbro documentation.